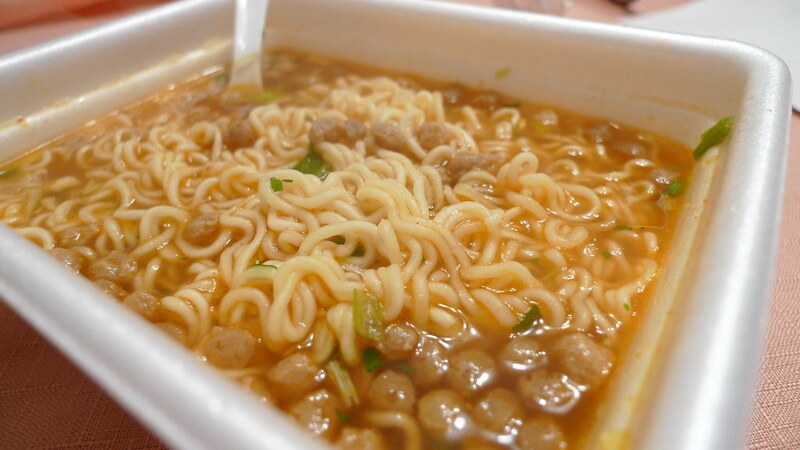 Paldo Dosirac Instant Noodle - beef cup. 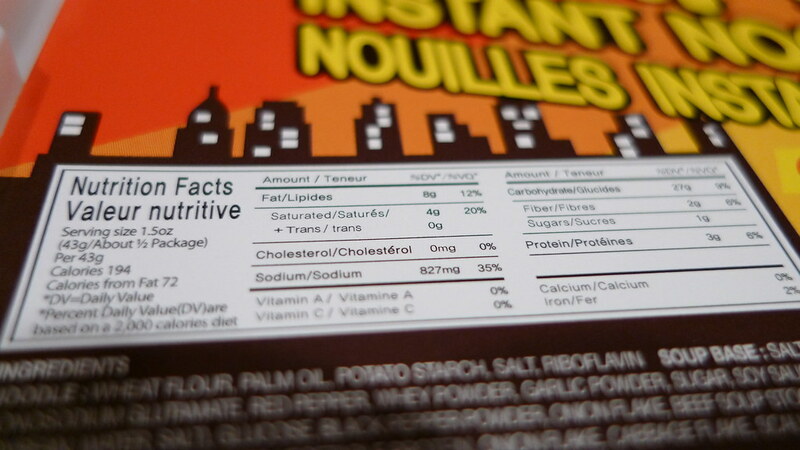 My first bowl noodle review gets to be Paldo's Dosirac Instant Noodle, beef flavor. I've never had it before. In fact, I've never even seen it before. It was on sale at Ranch 99, so I decided to give it a shot. Dosirac is made in Seocho-gu, Seoul by Korea Yakult Co., Ltd (한국야쿠르트), which is one of the largest food companies in South Korea. Despite this, most of their products are commonly purchased by Japanese under the brand name Paldo. (Overseas, the company distributes their products under this brand name.) Their products are purchased more there because Korea Yakult's overseas market is Yakult Honsha's home market. Confused? So am I. Let's just talk about the noodles. Everything that comes in the Dosirac cup. 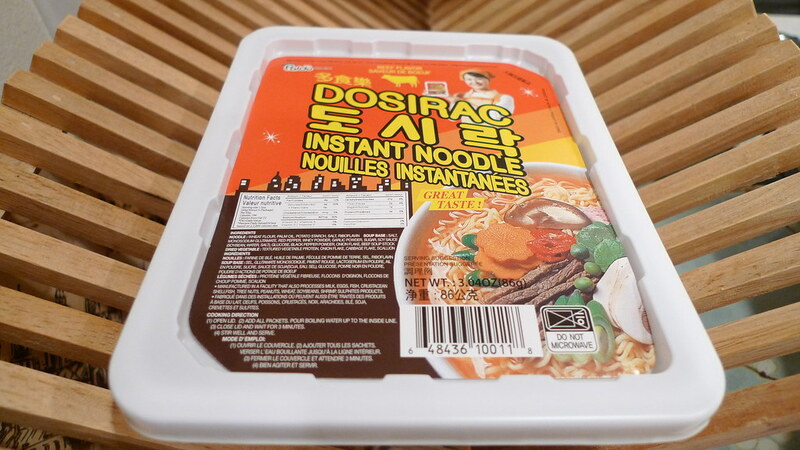 I was pleasantly surprised by Dosirac instant noodles. It is a bowl noodle, but it's small. It comes in a thin plastic rectangular bowl. 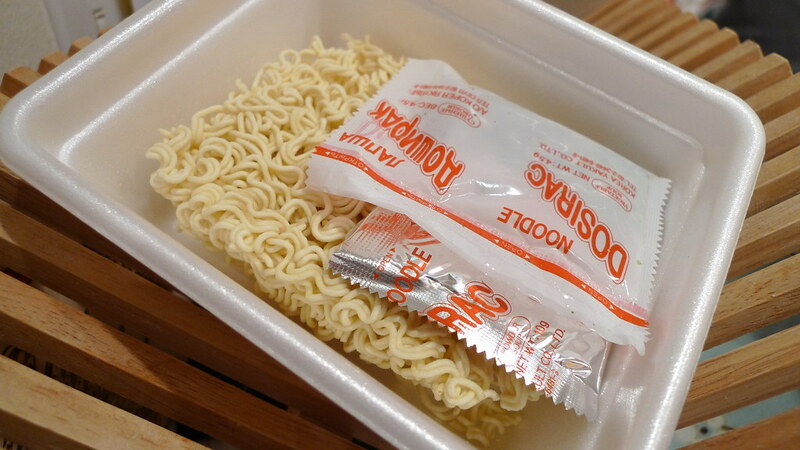 There is a plastic cover on it that you use when cooking the noodles, so no need to place something over the top to keep the heat trapped in. 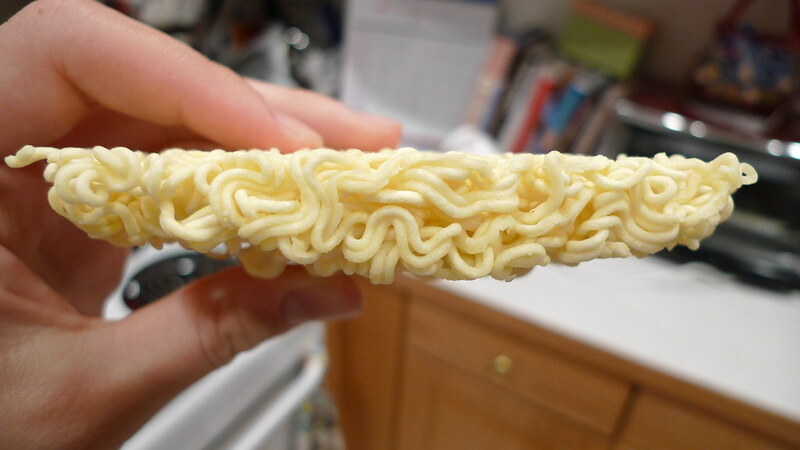 The thin brick of noodles. 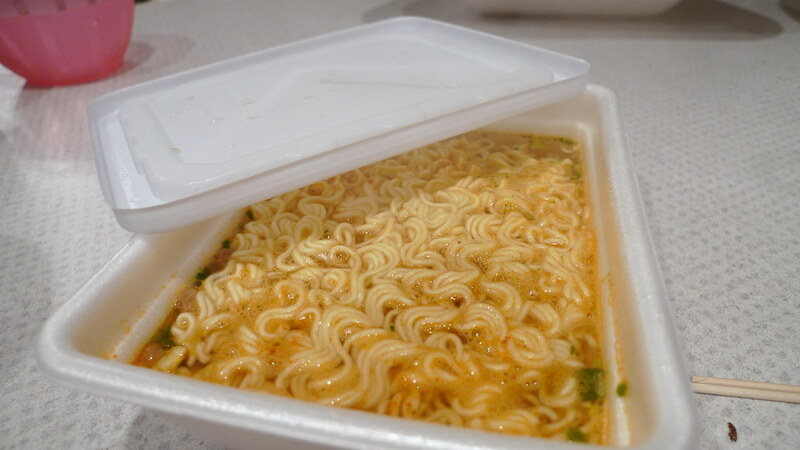 The noodles come in a thin brick. They are thinner than your typical ramen. 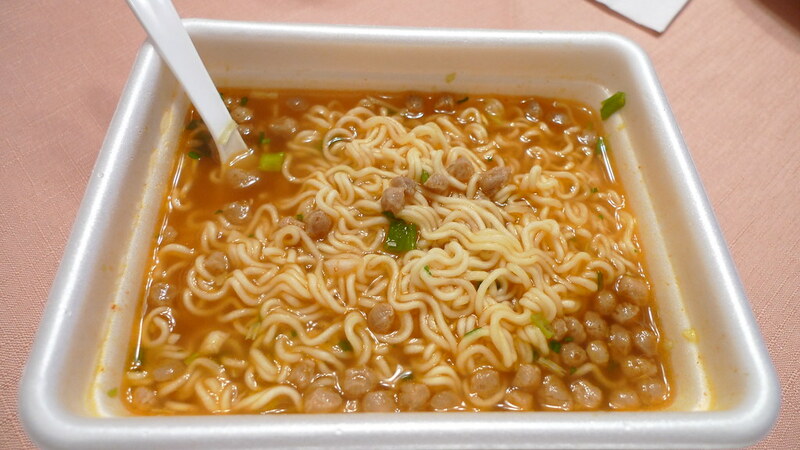 If you've had Nissin's Damae ramen, it's very similar to that. That being said, it also does not absorb the broth well. The broth was good, not great. I got the beef flavor, so obviously there was a beefy taste to it, but not a strong one. I was delighted to see that it was spicy though. I guess it's something to expect from noodles originating in Korea, but I still didn't. The spiciness isn't too strong. 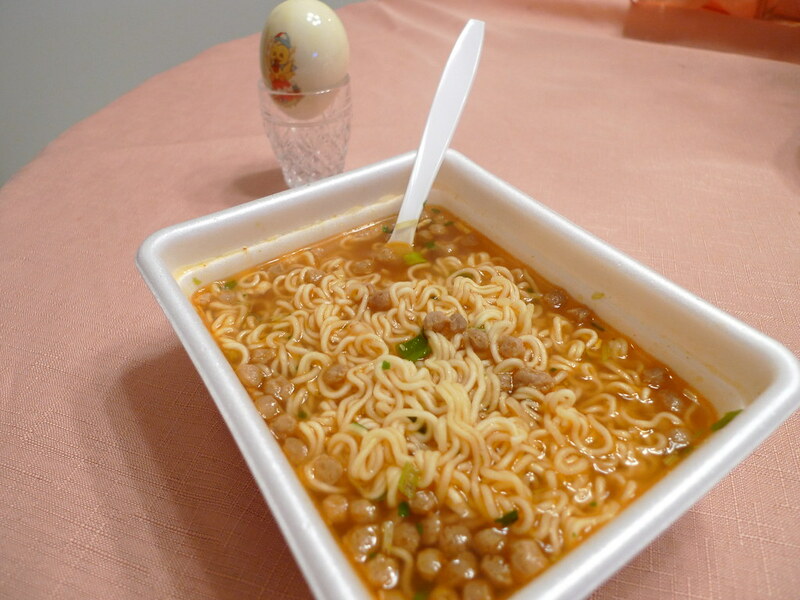 Compared to Shin Ramyun, it is weaker. It looks like beef, but is it? With the seasoning packet, you also get a packet of dried goodies. 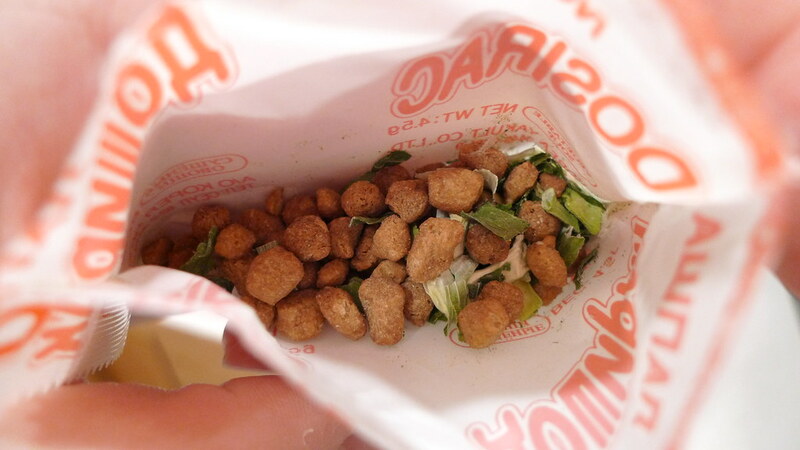 I thought the packet had small dried pieces of beef, but when I read the ingredients, I didn't find beef in it at all. They are "textured vegetable protein". Are you kidding me!? I ate vegetables!? I could have sworn they were sausagey pieces of beef, but I was fooled! The texture was a bit funny, but I didn't think too much of it. It's generally why I don't like vegetarian sausage, burgers, or meatloaf. Dosirac beef, ready to be consumed. I didn't have Juliana try it since it was kind of spicy, and the last time I gave her spicy noodles, she didn't have the best reaction. 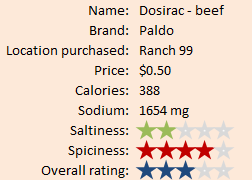 Dosirac is a nice bowl noodle, but it's not great. I wouldn't mind having it a few more times and trying the other flavors. 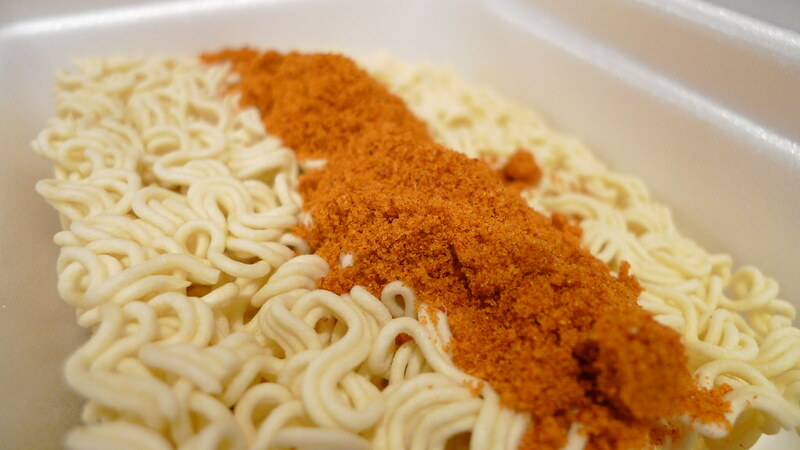 I have been a fan of Paldo noodles for years. I have tried all flavors and they are all are good, The Kimchee,flavor is a particular favorite of mine.